Last night, I cooked #14 from Summer Express: 101 Simple Meals Ready in 10 Minutes or Less. Notes: I put the water on to boil for pasta… then, you know, just to kill a little time, I started looking at YouTube clips of David Tennant. Next thing I know, the water’s boiling full tilt and I’m all googly-eyed, thinking about foxy 945-year-old Time Lords, while haphazardly chopping and throwing stuff into a frying pan. Anyway, it gets made, we eat it, and it’s fantastic. I go to put the leftovers away and there it is: the bread crumbs. Evidently, I never did put ’em in. It was still really good; I just wonder how much better it would have been with the bread crumbs. I could blame David Tennant, but that would just be wrong. Rating: Excellent (more or less). ← I am a marketing guy’s dream. Oh, and I blame the last two hours of wasted time on you. Um. Ok, MOST people would call it wasted. I call it making the husband a happy camper tonight. Jennifer: See? NOW do you see how I messed up this recipe? I was all “hee hee! *click* hee! *click* whee!” all over YouTube. Feel free to add me on Facebook! This looks amazing, and so easy! Perfect summertime dinner. 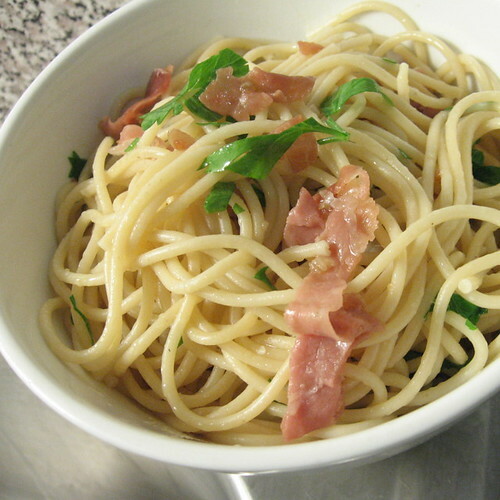 Pingback: #14 (sort of): Pasta with Prosciutto on Flickr - Photo Sharing!